You can use configurations with both resilient and non-resilient domains. The following figure shows that I/O domain A and I/O domain C are not resilient because neither use multipathing. I/O domain A has a virtual function and I/O domain C has a direct I/O device. I/O domain B and I/O domain D are resilient. I/O domains A, B, and D depend on root domain A. I/O domains B and D depend on root domain B. I/O domain C depends on root domain C.
If root domain A is interrupted, I/O domain A is interrupted as well. 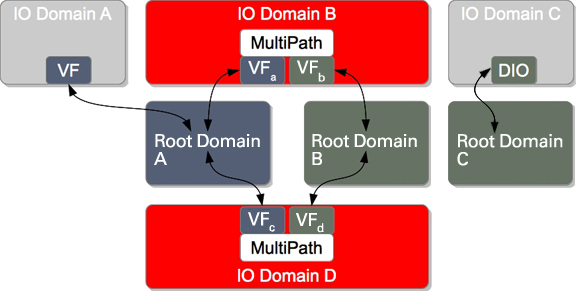 I/O domains B and D, however, fail over to alternate paths and continue to run applications. If root domain C is interrupted, I/O domain C fails in the way specified by the failure-policy property value of root domain C.